Embark on an intermediate to advanced kayaking expedition on world-class rivers surrounding the village of San Agustín. Enjoy day trips and gain in confidence before taking on a 2 day trip on the upper Magdalena River, the source of Colombia’s largest river! Enjoy the cultural wonders of the area en the perfect climate of the region! The fitness level required for this expedition is a 4 out of 5. Get ready for serious, heart-raising physical activity! Perfect for a fun winter kayak trip! After your domestic flight to Popoyan, receive an airport pick-up at the closest major airport to San San Agustín, Guillermo León Valencia Airport in Popayan. If you are flying internationally, speak with us to make your travel arrangements from Cali’s Alfonso Bonilla Aragón International Airport. Depending on your flight arrival time, join your guide to drive 137 km, about 4 hours 20 minutes, to San Agustín. Stay overnight in San Augustine at a comfortable, Colombian hotel and enjoy gourmet restaurants within walking distance to your hotel. After breakfast at your hotel, visit the San Agustín Archaeological Park. After lunch with your guide, become introduced to the expedition itinerary, review your gear, and pack for your rafting trip. In the afternoon, drive twenty minutes to the put-in to get your first taste of Colombian whitewater on the Magdalena and enjoy a scenic float in the jungle on fun class 2 to 3 rapids. Return to San Agustín and enjoy the many Colombian restaurants within walking distance from your hotel. After breakfast at your hotel, gear up for a day adventure rafting the Middle Section of the Río Magdalena. This intermediate section (Class 3) has many fun rapids that all run into swimmable pools, which is ideal for your first day on the river. Return to San Agustín and enjoy the many Colombian restaurants within walking distance from your hotel. After breakfast at your hotel, gear up for a day adventure paddling the Estrecho Section of the Río Magdalena. This beautiful big water section is mostly Class 3 rapids with a few challenging Class 4 rapids.Here, the Magdalena flows deep into a steep canyon and there are many beautiful waterfalls cascading down tall walls. Under the professional guidance of your raft instructor, review river rescue techniques learned the day before. Return to San Agustín and enjoy the many Colombian restaurants within walking distance from your hotel. After breakfast at your hotel, check in with your team of guides about the day’s plan. Depending on the water level, today you will be paddling the Río Somberio, an extremely fun low volume class 3 run. Another option is Río Naranjos, low volume creek ideally steps up for numerous fun drops and technical moves. Your final option is to paddle the Lower Section of the Río Mazamorras, a 17km whitewater run packed with fun moves that will get your heart beating (class 3 to 4). Return to San Agustín and enjoy the many Colombian restaurants within walking distance from your hotel. 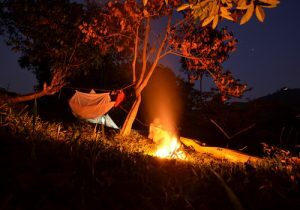 After a campfire breakfast, begin a 2 days kayak expedition on the Río Magdalena, Colombia’s largest river. 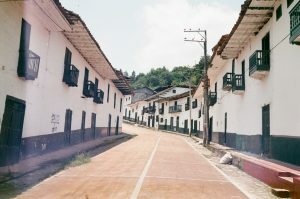 Load in a comfortable 4*4 truck and head to Qinchana, a small ” Vereda” village at the end of the road. Access the upper Río Magdalena just 40 kilometers from its source. From there, 60 kilometers of pristine whitewater awaits! Camp in sheltered hammocks at our jungle camp and enjoy French-Colombian inspired fresh meals cooked on the open campfire by the river. Wake up in the jungle and after a campfire breakfast, continue your journey downstream and stop at times to explore a side creek. Take time to experience the astonishing biodiversity and local ecosystems. Enjoy world class whitewater while improving on your technical moves with guided instruction. Return to your hotel in San Augustin and enjoy local restaurants within walking distance to your hotel. After breakfast at your hotel, meet your guide for a final day of world-class whitewater paddling. Head to the Río Mazamorra and use the skills you’ve learned this week! Stop halfway for a traditional “carne asada” cooked on the fire. At the end of the day, drive back to the village for a gourmet dinner and your last night of celebration. Stay overnight in your hotel. After breakfast at your hotel, recieve an airport drops off to the closest major airport to San Augustine, Guillermo León Valencia Airport in Popoyan (4 hours and 20 min drive). If you are flying internationally, speak with us to make your travel arrangements from Cali Alfonso Bonilla Aragón International Airport (6 hours drive). Kayaks and gear are available for rental for $250 USD per person.